Is Your Dog a Senior Citizen? Conventional wisdom says one canine year is equivalent to seven human years. But a more accurate representation depends on both age and size to classify your dog as young, adult, senior or geriatric. The figures down the left side of the chart are the actual age of the dog. The figures across the top of the chart are the weight bracket for the dog. The figures inside the chart are the equivalent age of the dog. Equivalent ages in green are classified as "adult". 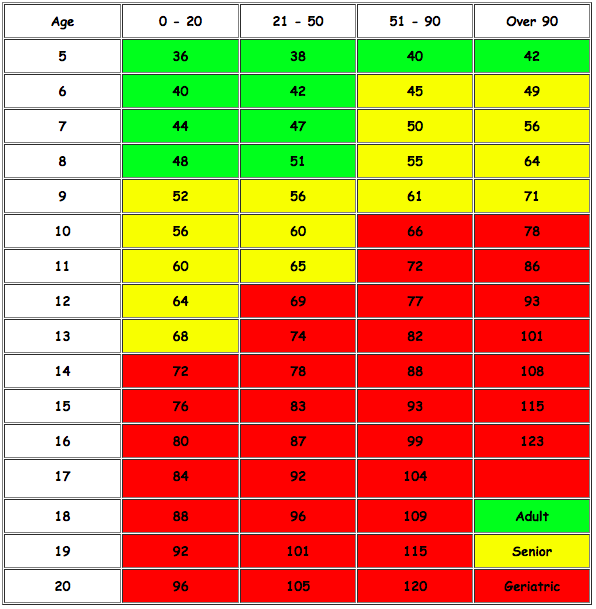 Equivalent ages in yellow are "senior", and equivalent ages in red are "geriatric". Example: a ten-year old dog that weighs 40 pounds has an equivalent age of 60 years.